Bangkok is special to me, because this is where I first backpacked solo abroad. I remember booking a cheap airfare months before my trip. I booked a tour and a hotel from a travel agency but after paying it, they called me and said I had to pay for two because the hotel room is good for two. So I asked for a refund. 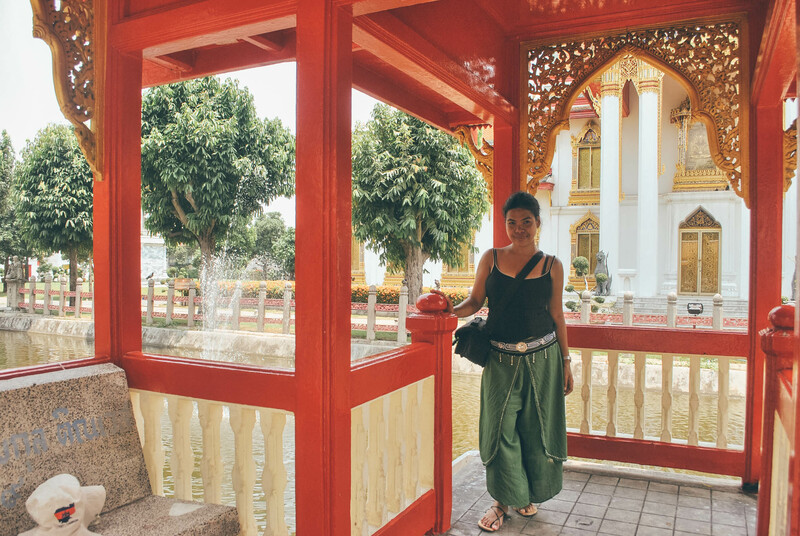 And that’s how I started researching about DIY trips to Bangkok, Thailand that eventually led me to setting up this blog. I read a Bangkok Travel Guide that introduced the concept of backpacking and DIY travels to me. 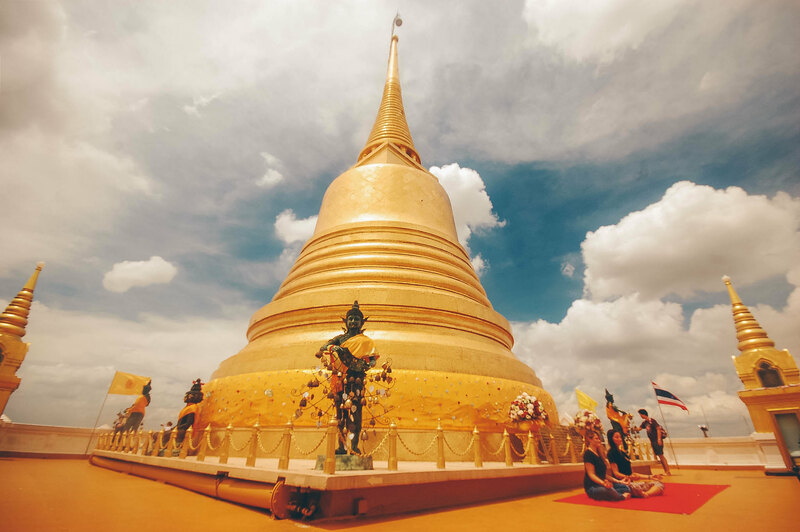 Bangkok is a good introduction to Southeast Asia backpacking because everything here is cheap (hotels, food, tours, shopping, transportation, etc. ), it is easy to explore, it is rich in culture, it has arguably the best food in Southeast Asia, it is tourist-friendly (save for a few pushy touts), it is generally safe (except for tuktuk scams) and it is easy to cross the border (from Thailand) to neighboring countries like Cambodia, Laos and Malaysia. 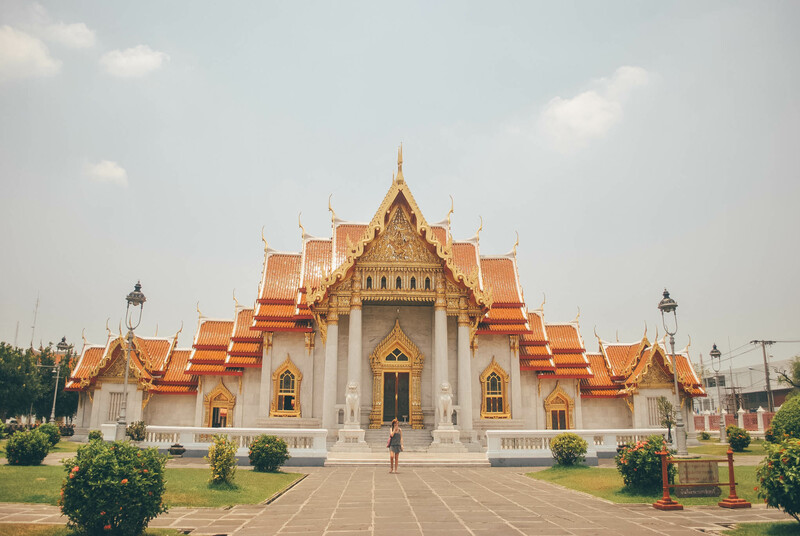 I’ll blog about border-crossing from Thailand in the future, but for the meantime, here’s my Bangkok Travel Guide with budget and itinerary to help you plan your next trip..
Bangkok is situated in Southeast Asia, near the equator, dear readers. So expect it to be hot and humid during summer and prepare for torrential downpour during the rainy season. November to February is the best season to visit Bangkok since it is cool and dry. I have traveled to Bangkok a few times during this season. However if you want to avoid the crowd, take note that December to January is the peak season. March to June is pretty hot, I traveled a few times to Bangkok during this season and I could not stand staying in a fan room. I recommend booking an air-conditioned room if you plan to travel around the aforementioned months. If you want to get a tan, this is a good season for Thailand beaches. And if you are in Bangkok around second week of April, don’t miss the popular Songkran Festival. July to October is the wet season, expect drizzles to heavy downpour that might ruin your travel plans. However, there is a good side to the low season, hotels and airfares can go as low as 50% off, so it can be pretty tempting to travel. Bangkok uses Thai Bhat (THB or B) as currency. But I suggest you bring US dollars to get a better rate. I had a hard time finding a money changer in Bangkok that accepts Philippine peso the last time I was there. Money exchange shops are widespread in Bangkok, but I prefer withdrawing from ATMs sprinkled around the city since bank rates are usually better. Take note though that there is a THB 150/PHP 229 (USD 5/EURO 4/SGD 6/MYR 19) fee on foreign accounts. So if you plan to withdraw, make it one time big time since the fee per transaction is quite hefty. 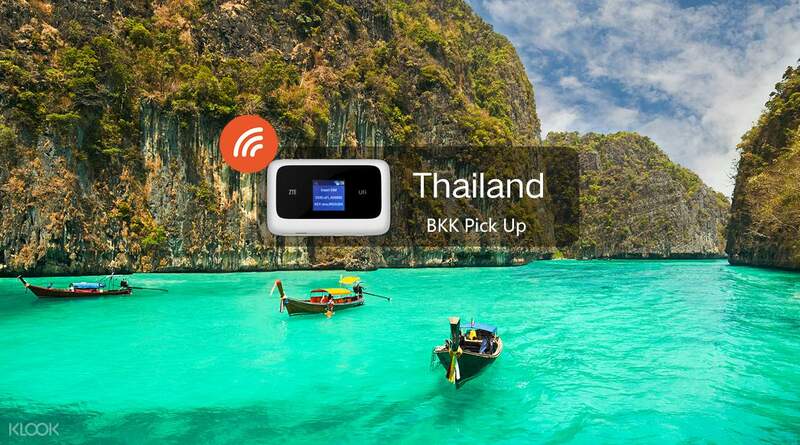 Stay connected online in Thailand by renting a pocket Wi-Fi. Bangkok and the rest of Thailand uses 220 V. Power outlets commonly have two-prong round or flat sockets. Bring universal adapter plug. You can also buy at convenience stores in Bangkok like 7Eleven. Take note that the Philippines is 1 hour ahead of Bangkok, Thailand. Adjust your watch while in Bangkok so you won’t miss your tour or flight. Philippine Passport holders are entitled to a 30 day visa-free entry (by air) to Thailand. If arriving by land like crossing borders from Cambodia, Laos or Malaysia, you will only get a 15 day visa-free stay. Several airlines fly to Bangkok from Manila like Cebu Pacific, Thai Airways and Philippine Airlines. Cheapest is via Cebu Pacific regular airfare is about PHP 5,000 + one way. If you will be taking Uber/Grab/Taxi from Bangkok Airport (Suvarnabhumi) to Bangkok City, expect to pay around TBH 375/PHP 573 (USD 11/EURO 10/SGD 375/MYR 48). This is the fastest way to get to Bangkok City from Bangkok Airport (Suvarnabhumi Airport) if you want to avoid the infamous Bangkok traffic. The line starts at Phyathai Station to Suvarnabhumi Airport. The Airport line stops at 6 stations along the way: Rajprarop Station, Makkasan Station, Ramkhamhaeng Station, Hua Mark Station, Thab Chang Station and Lad Krabang Station. The Airport Line is open from 6:00 AM to 12:00 midnight only. If you want to get to Bangkok City, you can connect to the BTS Skytrain at (A6) Makkasan Station (5th station from the airport) for TBH 35/PHP 54 (USD 1/EURO 0.89/SGD 1.43/MYR 4.43) or to (A8) Phyathai Station (7th/last station from the airport) for TBH 45/PHP 69 (USD 1.35/EURO 1.14/SGD 2/MYR 6). Transit time is roughly 30 minutes. Coming from Bangkok (Suvarnabhumi) Airport Sukhumvit, Uber/Grabe/Taxi will cost you around TBH 325/PHP 496 (USD 10/EURO 8/ SGD 13/MYR 41). STEP 1: Take the Airport Line and alight at Makkasan Station. STEP 2: Transfer to MRT Blue Line bound for Hua Lamphong. Get off at Sukhumvit Station. If you decide to take UBER/Grab/taxi to Khao San Road, prepare to pay around TBH 375/PHP 573 (USD 11/EURO 10/SGD 375/MYR 48). From Bangkok Airport to get to your hotel in Khao San Road, you can take the Airport Line + BTS Skytrain. The closest BTS Skytrain stations are National Stadium Station (closest station but needs 2 transfers), Ratchatewi Station (1 transfer) and Siam Station (1 transfer) but it is still quite far, about 5 KM. So from any of these stations, you can take Uber/Grab or taxi to Khao San Road. STEP 1: Take the Airport Line to Phyathai (Phaya Thai) Station. STEP 2: Transfer to dark green line and alight at Ratchatewi Station or Siam Station. Take a cab/Uber/Grab to Khao San Road. Fare is around TBH 107/PHP 163 (USD 3/EURO 3/SGD 4.36/MYR 14). STEP 2: Transfer to dark green line and alight at Siam Station. STEP 3: From Siam Station, transfer to light green line to National Stadium. STEP 4: Take UBER/Grab/taxi to Khao San Road. Fare is about TBH 95/PHP 145 (USD 3/EURO 3/SGD 4/MYR 12). IMPORTANT: Good news is, the MRT Extension has been approved, so once that line opens, you can just get off at Democracy Monument Station (OR 5) and walk to Khao San Road. Uber/Grab/Taxi to Silom from Bangkok Airport (Suvarnabumi) will cost roughly TBH 375/PHP 573 (USD 11/EURO 10/SGD 375/MYR 48). STEP 2: Transfer to MRT Blue Line en route to Hua Lamphong. Get off at Silom (Si Lom) Station. STEP 1: Take the Airport Line and get off at Phyathai (Phaya Thai) Station. STEP 2: Transfer to BTS Sukhumvit Line en route to Bearing and alight at Siam Station. STEP 3: Transfer to BTS Silom Line en route to Bang Wa) and get off at Saladaeng Station. A cheap way to get around Bangkok is via the train (BTS Skytrain/MRT). You can use single-trip tokens or pre-paid Smart Passes. 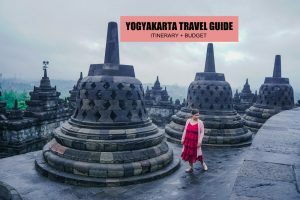 Single Journey tokens will cost you THB 15/PHP 23 (USD 0.45/EURO 4/SGD 0.61/MYR 2) – THB 52/PHP 80 (USD 2/EURO 4/SGD 2/MYR 7) depending on the number of zones you crossed, while the day pass is THB 130/PHP 199 (USD 4/EURO 4/SGD 5/MYR 16). You can purchase tickets from the ticket booth or ticket machines in every station. Always print the receipt or ask for one, you might need it later. 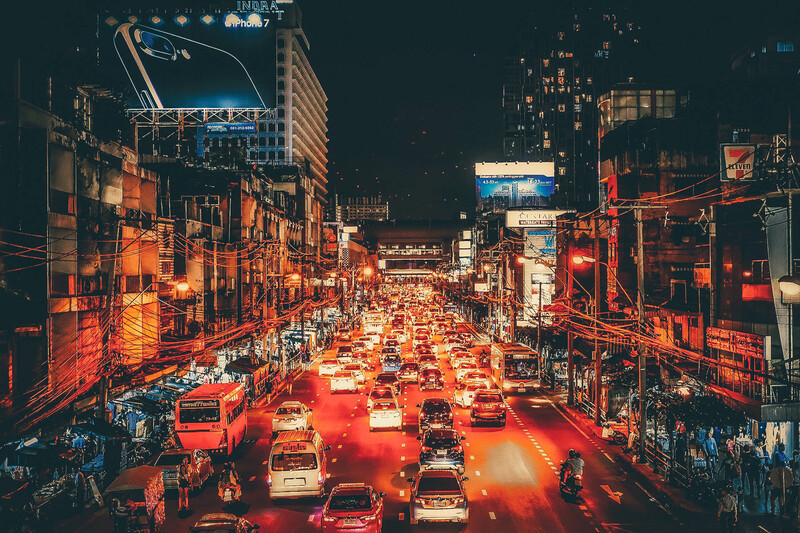 Thankfully, Uber and Grab are now available in Bangkok that will make commuting hassle-free! I’ve used taxi in Bangkok a few times, I just hail one and they automatically turn on the meter. If they don’t, insist on using it or get out and hail another cab. Do not approach the ones parked near Khao San Road, they don’t use the meter! Flag down is THB 35/PHP 53 (USD 1/EURO 0.89/SGD 1.43/MYR 35), and usually cost me around THB 70/PHP 107 (USD 2/EURO 2/SGD 3/MYR 9) to THB 100/PHP 153 (USD 3/EURO 3/SGD 4/MYR 13). BANGKOK SCAM ALERT (FLAT FARE TAXI): When you ride a taxi and the driver refuses to turn on the meter saying it’s a flat fare taxi. The driver will most likely charge you about 3 times the usual meter rate. Get off and hail another cab. 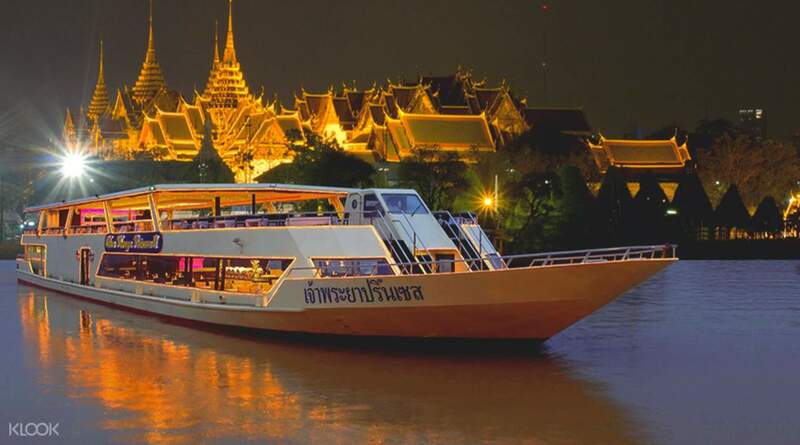 The Chao Phraya express boat is usually a cheap way to get to the Grand Palace complex and Wat Pho, not to mention you will avoid traffic. Meanwhile, the Saen Saep express boat is popular among locals for daily commute. IMPORTANT: If you are a female, do not sit next to a monk on a boat (or any public transportation) or stand in the same area of the boat. Do not touch them or their things. It is frowned upon. BANGKOK SCAM ALERT (TBH 10 or TBH 20 Tuktuk Ride): Don’t believe when a local approaches you and tells you that ferry is not frequent and will leave at certain times of the day only. He will then hail a tuktuk to take you around for about TBH 20/PHP 30 (USD 0.90/EURO 0.76/ SGD 1.22/MYR 4) but instead of taking you directly to your destination, the driver will take you to different travel agencies and shops. TBH 30 is a small amount but if you are pressed for time, this can ruin your itinerary. 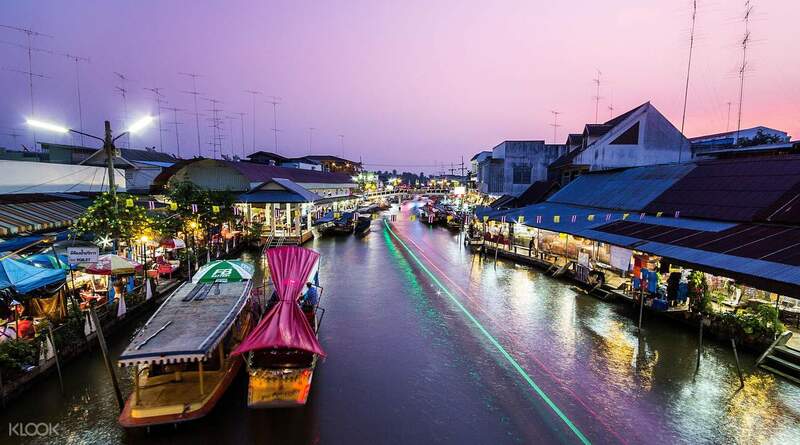 You can charter a long-tail boat to explore Khlong Bangkok Noi and other canals in Thonburi. Negotiate the price first before leaving. I’ve used the bus a few times before, it can be confusing. It’s a cheap way to get around Bangkok, however I won’t really recommend this because you might get lost if you don’t know where to get off. There are motorbikes that can take you to your destination (short-distances). I’ve used this a few times to get to my hotel and evade traffic. They are mostly wearing helmet and uniforms and parked at the BTS/MRT Stations or bus stop. The fares are clearly posted, so make sure you read them or ask the driver before hopping on the motorbike. Helmet is provided. Honestly, I’ve never used a tuktuk before for my Bangkok tour because of the gem scam issue. But a good friend advised me, it is not as bad as he thought. The drivers will add the gem market to the destination (it’s like when you take the tours in Vietnam or Indonesia and they take you to souvenir shops where the driver and the tourist guide get commissions). So it’s still up to you if you will purchase from those gem stores. If you do, they will get a commission. 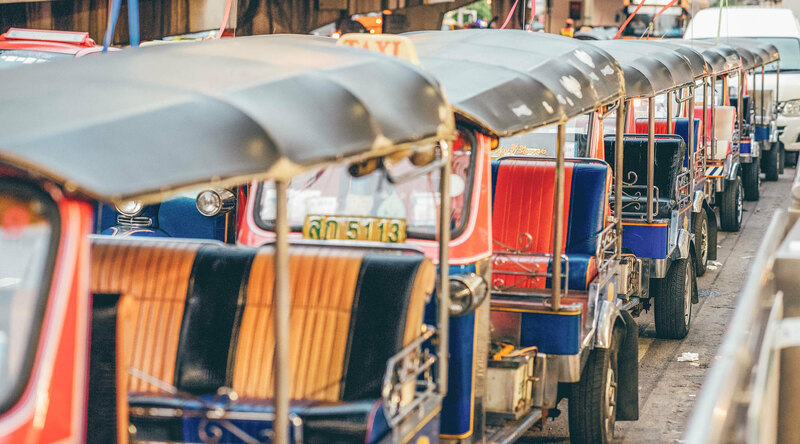 But if you are really hesitant since this will waste your time and ruin your itinerary but you want to experience riding in a tuktuk, you can use it for short distance ride but be wary of another scam the TBH 10 or 20 tuktuk ride. See details below this post (list of Bangkok Scams). BANGKOK SCAM ALERT (CLOSED FOR TODAY): Don’t believe when a friendly local approaches you and introduces himself as a teacher and then will tell you that the Grand Palace or a certain temple or a certain attraction is closed for a Buddhist holiday or cleaning. He will then hail an accomplice tuktuk to tour you or take you to another temple or attraction. The driver will drive you around to gem stores or shops and get a commission for taking you there. I was told they usually get gas coupons. This is where Bangkok’s most important temples are concentrated, including the Grand Palace and Wat Pho. 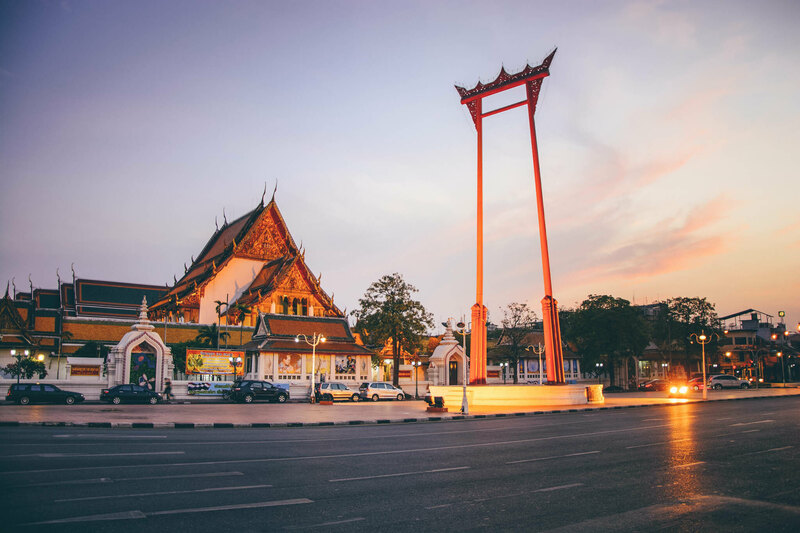 Dubbed as the historic center of Bangkok, Rattanakosin established sometime in 1782 when the capital of Thai Kingdom was moved here – Rattanakosin Kingdom, which was the 4th Kingdom of Thailand. 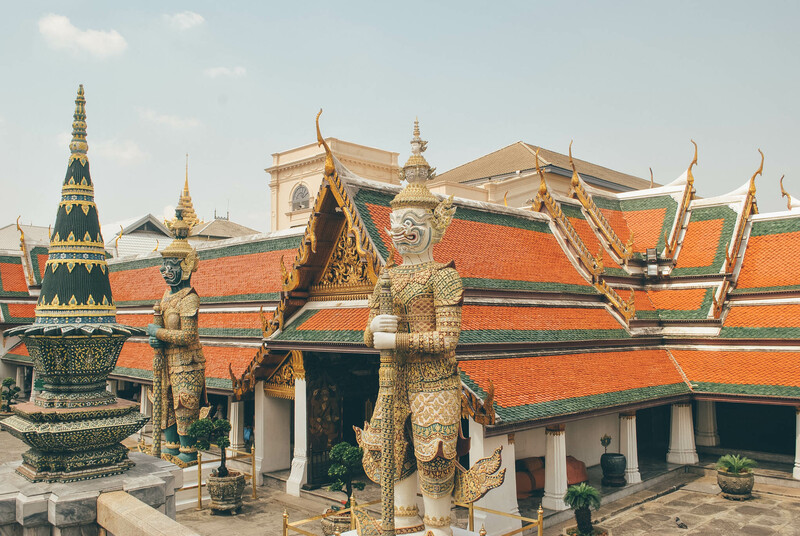 When in Bangkok, don’t miss the Grand Palace the official residence of the Kings of Thailand since 1782. This sprawling complex is sprinkled with jaw-dropping buildings, gardens and pavilions. Entrance Fee: THB 500/PHP 764 (USD 15/EURO 13/SGD 20/MYR 63), ticket includes a visit to Wat Phraew and Dusit Palace (you can use within 7 days). BANGKOK SCAM ALERT: If a local approaches you and tells you the Grand Palace is close for the day and offers to take you to other temples instead. Do not believe him/her. It’s a scam. Go directly to the main entrance. DRESS CODE: Do not wear shorts or tank tops, it is considered disrespectful. Make sure your legs and shoulders are covered. You can rent sarong near the palace gate in case you failed to comply like me. STEP 1: Take the Silom Line (BTS Skytrain) and alight at (S6) Saphan Taksin Station. STEP 2: Hop on the Chao Phraya Express Boat to Ta Chang Pier (No.9). From here, the Grand Palace is about a 5-10 minute walk. If coming from Khao San Road, the Grand Palace is about 20-30 minute walk. Consult Google Maps for directions. Or just take a taxi or UBER/Grab for about THB 47/PHP 72 (USD 1.42/EURO 1.19/SGD 2/MYR 6). I’ve tried this route twice but I usually visit other temples along the way. Will write a more detailed Bangkok Walking Tour blog soon. If coming from the National Stadium, Silom or Lumphini BTS/MRT Station, you can take Bus #47. Fare is about THB 7/PHP 11 (USD 0.21/EURO 0.18/SGD 0.29/MYR 0.89) on weekdays and FREE during weekends. 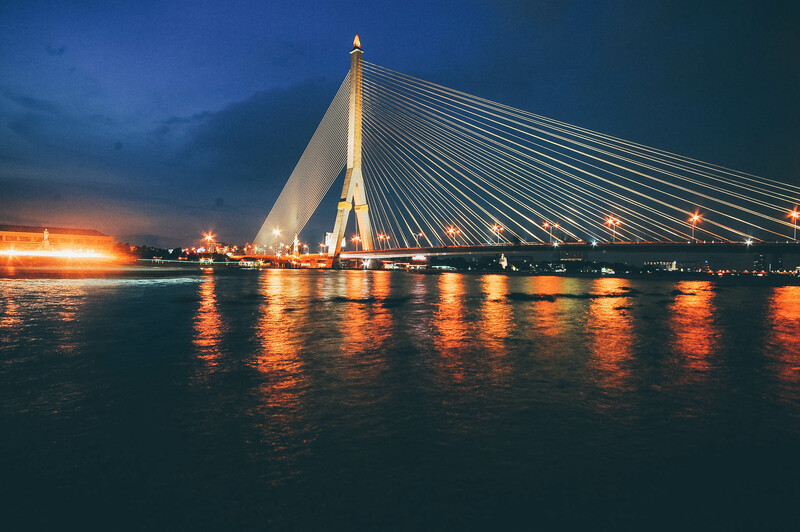 From Phaya Thai, Hua Lamphong BTS/MRT Station or National Stadium, you may take a cab or UBER/GRAB for about THB 100/PHP 153 (USD 3/EURO 3/SGD 4/MYR 13). 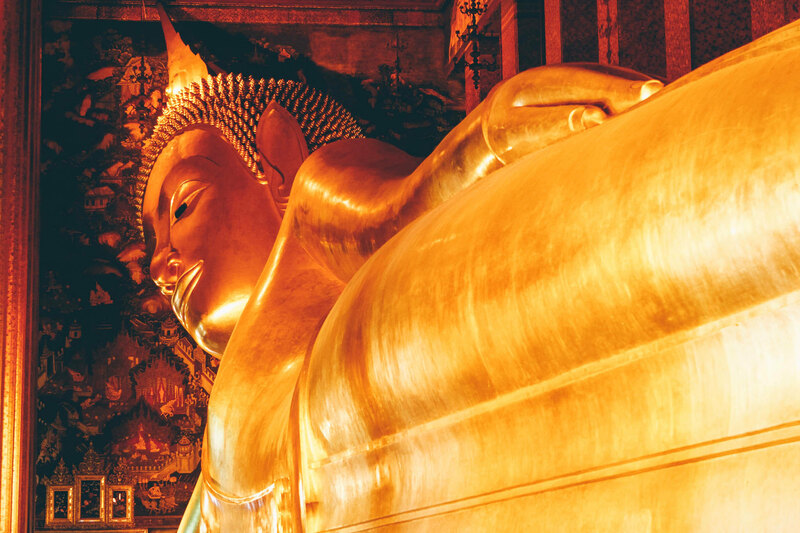 Nearby the Grand Palace is another famous temple – Wat Pho, known for its gigantic reclining Buddha. But more than that, Wat Pho is actually the earliest public education center in Thailand. 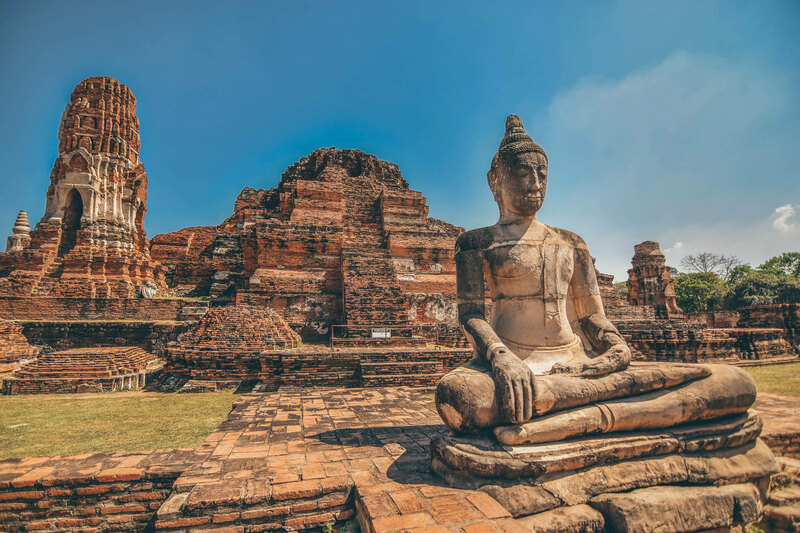 Interestingly, the Epigraphic Archives of Wat Pho (Temple of the Bodhi Tree) in Bangkok has been recognised by UNESCO in its Memory of the World Programme. See directions above for getting to The Grand Palace. Wat Pho is near Tha Tien Pier adjacent to the Grand Palace but it is located on the other side of the entrance gate. See directions above to get to the Grand Place. Then ride the boat to Wat Arun at Than Tien Pier near the Grand Palace. Fare is THB 4/PHP 6 (USD 0.12/EURO 0.10/SGD 0.16/MYR 0.51). Boat leaves every 10-15 minutes from 6:00 AM to 10:00 PM. 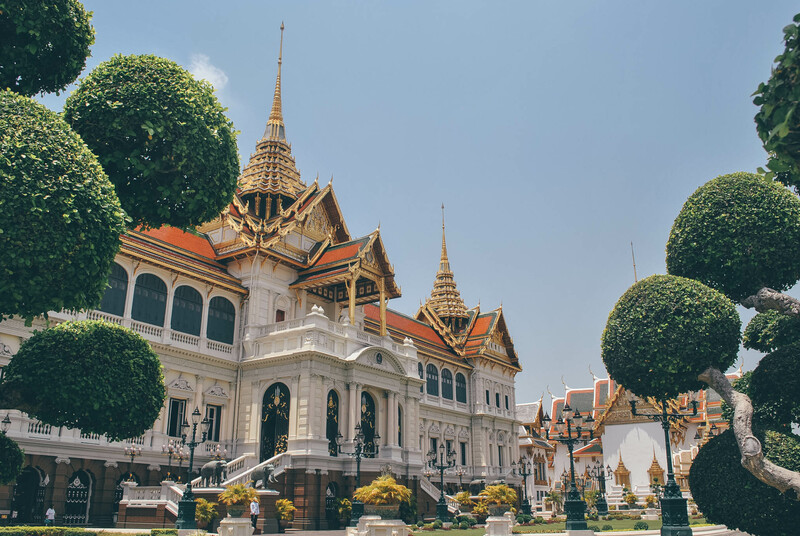 Dusit is the the administrative center of Thailand, this is where the royal palace is located, as well as the magnificent Dusit Palace, Vimanmek Teakwood Mansion and Marble Palace. Ananta Samakhom Throne Hall is my favorite building in Bangkok because of the intricate paintings on its ceiling and the surreal Arts of the Kingdom exhibit. As of October 1, 2017, the Dusit Palace is indefinitely closed and the Arts of the Kingdom exhibit will be moved to Ayutthaya. Entrance Fee: THB 150/PHP 229 (USD 5/EURO 4/SGD 6/MYR 19). 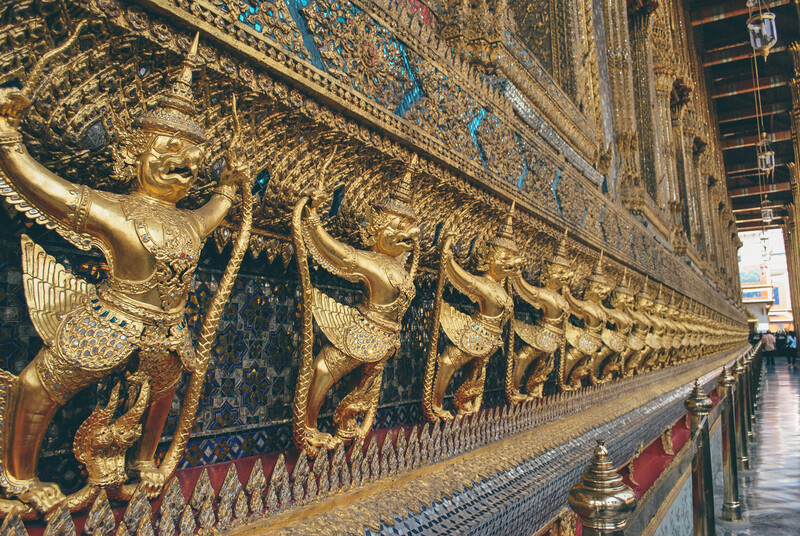 But if you have the Grand Palace Ticket, it is included in the ticket so long as you pay a visit within 7 days. DRESS CODE: Do not wear shorts or tank tops and make sure your legs and shoulders are covered. You can rent sarong near the palace gate in case you failed to comply like me. IMPORTANT: Photography is not allowed inside, you need to deposit your bags including your camera and phone. The most convenient is to get there by Uber/Grab or Taxi. If coming from the Grand Palace to Dusit Palace (type Ananta Samakhom Throne Hall in Uber) fare is around TBH 145/PHP 221 (USD 4.35/EURO 3.68/SGD 6/MYR 18).. If coming from Khao San Road to Dusit Palace (type Ananta Samakhom Throne Hall in Uber), fare is about TBH 112/PHP 171 (USD 3.36/EURO 3/SGD 5/MYR 14). But if you want to save a few bucks, you can ride the BTS Skytrain to Victory Moment Station and ride air-conditioned bus 12 or 515 to Dusit Palace at Ratchawithi Road. Alternatively, you can take the BTS Skytrain to Rajchathevi Station and ride bus 16. If you are coming the Old City, take air-conditioned bus 70 to the Dusit Palace. You can hail bus 70 at Sanam Luang near the Grand Palace. If you are at Khao San Road area, you can hail bus 70 at Ratchadamnoen Klang Road. Then, alight outside the Royal Elephant National Museum at Uthong Nai Road. To be sure, ask the locals where to get off. You can also take bus #3/9/32/43/64/65/524 and alight at Thewet Market or The National Library. Then, you can reach Dusit Palace on foot. 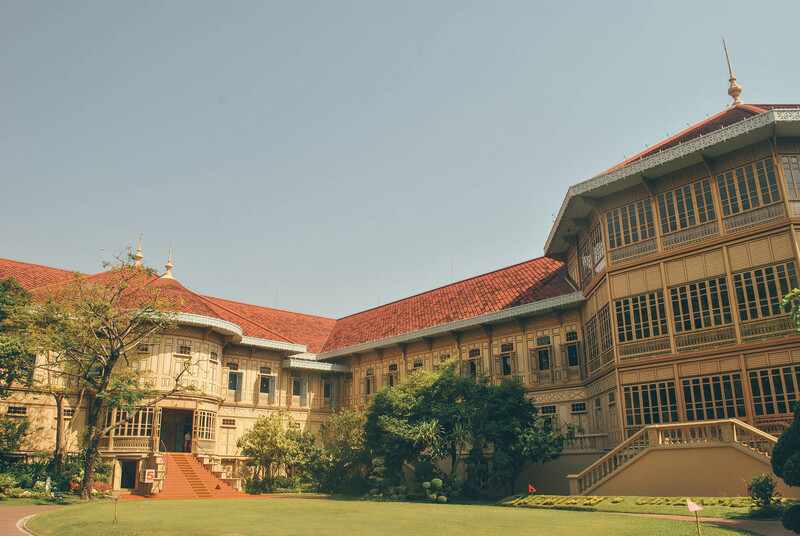 What makes Vimanmek Mansion special, which is a former royal villa in Bangkok, is entire museum was built out of golden teak. Today, the mansion has been turned into a museum that is open to the public. Update: Building is closed for renovation. This is near The Grand Palace and Khao San Road. STEP 1: Ride the BTS Sky Train to Ratchathewi Station (N1) (Sukhumvit Line). Take Exit 1 and upon exiting turn around and walk straight ahead to Khlong Saen Seab. STEP 2: Ride the long tail boat from the pier to Phan Fha Pier at Wat Saket. Take the BTS Skytrain to Saphan Taksin [S6]. From Saphan Taksin Station, take exit 2 to the pier, about 80 steps. Take the ferry to Aisiatique. Ferry runs from 4:00 PM to 11:00 PM. The free ferry runs until 8:00 PM only, so from 8:01 PM to 11:00 PM, you need to pay for the ferry. Witness fight scenes straight out of the big screen – in this live show on stage! 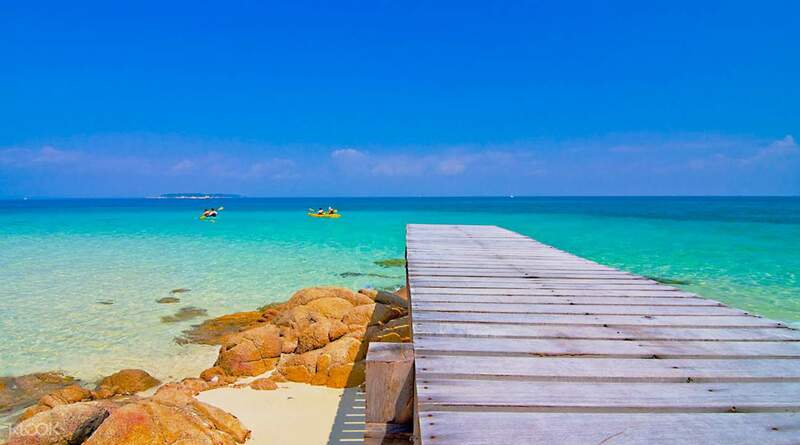 Visit the neighboring seaside city of Pattaya and explore its scenic beaches on a day trip from Bangkok! Enjoy fun-filled water activities such as jet ski, parasailing, sea walking, snorkeling and more! An English, Chinese, Japanese, or Korean speaking guide is available to guide you! This famed 8 storied mall is packed with over 2,000 shops selling clothes, bags, accessories, electronic gadgets, mobile phones and cameras. Prices are negotiable here. Ride the BTS Skytrain and get off at National Stadium Station. MBK can be reached on foot from there. 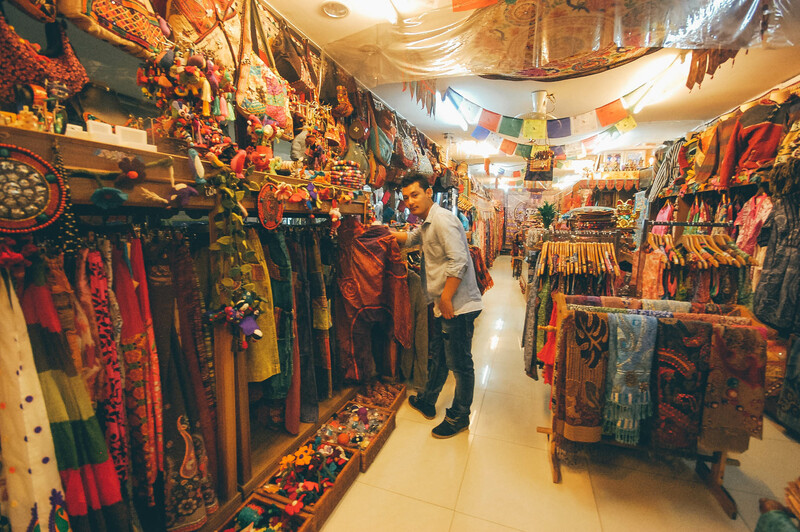 If you like bargain hunting then Chatuchak Market is for you. You can find almost everything you need here at bargain prices. You can even purchase in wholesale price. Take the BTS Skytrain and alight at Mo Chit station. Take Exit 1 and follow the crowd until you see stalls selling apparels. Turn right and continue to follow the crowd. You should see a small entrance to the Chatuchak Mark. Terminal 21 houses over 600 shops in its 9 floors selling everything you can possibly need. What’s unique about this mall is each floor features different cities like Tokyo, London, Paris, Hollywood, Caribbean, Istanbul and San Francisco. Take the BTS Skytrain and alight at Asok. If you’re in Bangkok on weekdays but you missed the Chatuchak Market, you can find dirt cheap clothes and other apparels at Platinum Fashion Mall instead. Take the BTS skytrain and alight at Chidlom Station. Take exit 9 and walk through Ratchaprasong Skywalk. Turn right to enter Gaysorn Plaza Building. Pantip Plaza is the place to be if you like to shop for mobile phones, cameras, software, computer accessories, software and hardware and other electronic gadgets that won’t empty your wallet. Take the BTS Skytrain and alight at BTS Chidlom Station. Hire a tuk-tuk or cab/ UBER/Grab to take you to Pantip Plaza. Alternatively, you may also walk 10 minutes down Ratchadamri Road past Central World on your left, over the Saen Saeb canal and then turn left on Phetburi Road. Walk for about two blocks to Pantip Plaza, which you should see on your left. Use Google Maps. Central World is the largest shopping mall in Thailand, and one of the largest in the world. You can find almost everything you need here. The mall has easy access to Erawan Shrine and Trimurti Shrine. Take the BTS SkyTrain and get off at E1 Chit Lom Station (Sukhumvit Line). Take Exit 9 for Skybridge to Gaysorn Plaza and cross road to Central World via flyover. This is the first mall I visited in Bangkok since it’s pretty accessible, just in front of Siam BTS Skytrain. Siam Paragon has over 250 shops that caters to high-end shoppers. Madame Tussauds is located on the 6th Floor of Siam Paragon. Take the BTS Skytrain and alight at Siam BTS Skytrain station. You won’t miss the mall because it is just in front of the station. Silom is the financial district of Bangkok. It is also a good base due to the wealth of budget hotels here plus access to MRT link to Hualamphong Station. Also check out the old backpacker neighborhood near Lumphini Park packed with affordable rooms. 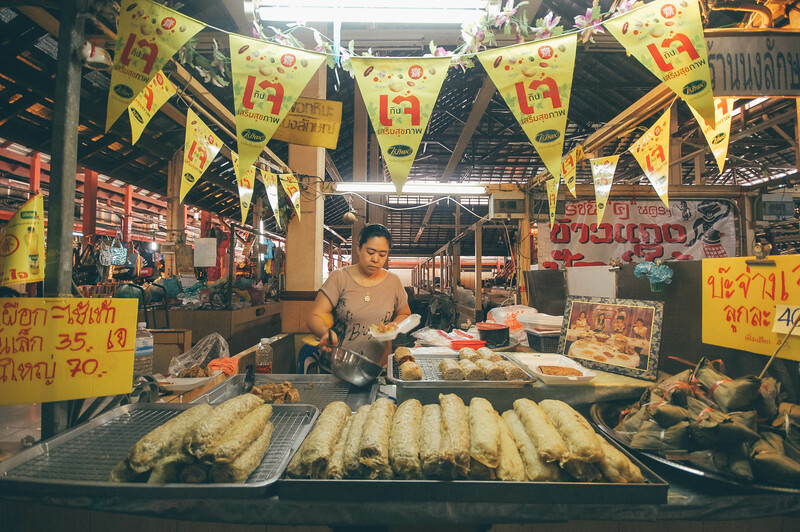 Khao San Road is Bangkok’s backpacker’s mecca. It is dappled with hostels, guesthouses and budget hotels Everything you could possibly need is available here. Sumkhumvit has a a wealth of budget and mid-range accomodations too. Also, it is pretty accessible as it is on the MRT links to the BTS and MRT Lines. It is also near the Eastern (Ekamai) bus station and the MRT links to Hualamphong Station. *Take note that the Philippines is 1 hour ahead of Bangkok, Thailand. Here’s a sample 4 days 3 nights Bangkok itinerary with side trip to Ayutthaya. Feel free to tweak this depending on your budget and schedule. 09:00 AM Take Airport Line to Bangkok City. 09:30 AM ETA Bangkok City. Transfer to BTS Skytrain. 10:00 AM Check-in at hotel. Freshen up. 11:00 AM ETA Grand Palace. From Khao San Road and Rambuttri Road: You can walk for about 20-25 minutes. 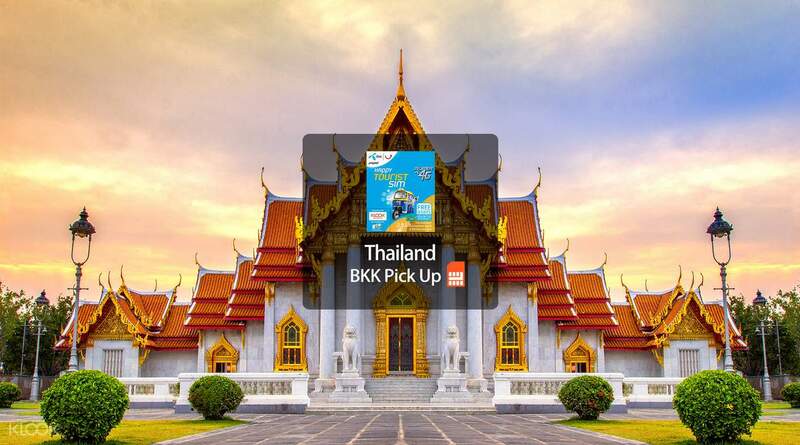 Get a map from Bangkok Airport or your hotel or consult Google Maps. Alternatively, you can just ride UBER/Grab or taxi for about THB 47/PHP 72 (USD 1.42/EURO 1.19/SGD 2/MYR 6). From Silom: Take the Silom Line (BTS Skytrain) and alight at (S6) Saphan Taksin Station. Then, ride the Chao Phraya Express Boat to Ta Chang Pier (No.9). From here, the Grand Palace is about a 5-10 minute walk. From Sukhumvit: Ride the BTS Skytrain and get off at Saphan Taksin Station. Hop on the Chao Phraya Express Boat to Ta Chang Pier (No.9). The Grand Palace is about 5-10 minute on foot. 11:30 AM ETA Grand Palace. Buy ticket and explore the palace ground and Wat Phra Kaew. IMPORTANT: Do not photograph the Emerald Buddha. 02:30 PM Walk for about 10 minutes to Wat Pho. 02:45 PM ETA Wat Pho. 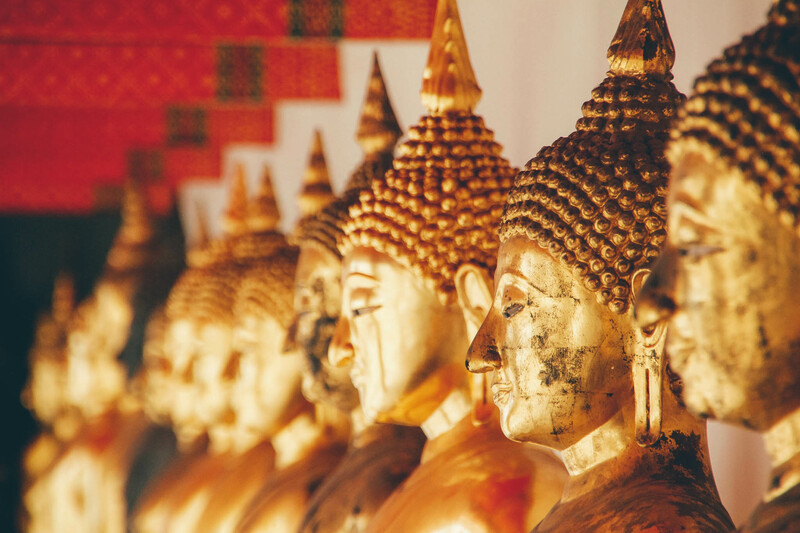 Explore Wat Pho. 05:00 PM ETD To Wat Arun. Ride the boat to Wat Arun at Than Tien Pier near the Grand Palace. Fare is roughly THB 4/PHP 6 (USD 0.12/EURO 0.10/SGD 0.16/MYR 0.51). Boat leaves every 10-15 minutes from 6:00 AM to 10:00 PM. 05:15 PM ETA Wat Arun. Explore. 07:00 PM Ride ferry back to Than Tien Pier. Fare is about THB 4/PHP 6 (USD 0.12/EURO 0.10/SGD 0.16/MYR 0.51). 07:15 PM Take UBER/Grab or taxi to Khao San Road for about THB 47/PHP 72 (USD 1.42/EURO 1.19/SGD 2/MYR 6). Alternatively, you can walk for about 20-25 minutes to Khao San Road. Consult Google Maps. Avoid dark alleys, walk in well-lighted streets. 07:30 PM ETA Khao San Road. Explore. 09:00 PM Shopping. Buy souvenirs. 11:00 PM Back to hotel. Sleep. 10:00 AM ETA Ayutthaya. Explore Bang Pa-In Summer Palace. 02:00 PM Explore Ayutthaya Temples: Wat Mahathat, Wat Phra Si Sanphet, Wat Lokayasutharam. 06:00 PM Ayutthaya Night Market. Food and snacks. 06:30 PM ETD for Bangkok. 08:00 PM ETA Bangkok – BTS Victory Monument station. 08:15 PM ETD Siam Paragon. Take the BTS Skytrain and alight at Siam BTS Skytrain station. 08:30 PM ETA Siam Paragon. Explore or enter Madame Tussauds on the 6th Floor of Siam Paragon. 09:30 PM Explore other shopping malls. Shop for souvenirs. 10:30 PM ETD for hotel. Take BTS Skytrain to Silom or Sukhumvit. If hotel is in Khao San Road. Alight at Silom and take Uber/Grab/Taxi to hotel. 11:00 PM ETA Hotel. Shower. Sleep. 10:00 AM ETA Damnoen Saduak Floating Market. Take the 30 minutes boat ride. 10:30 AM Explore Floating Market. 12:00 PM ETD for Bangkok. 01:00 PM ETA Bangkok. BTS Victory Monument Station or Grand Palace. 01:30 PM Option 1: ETD Dusit Palace (Ananta Samakhom Throne Hall). 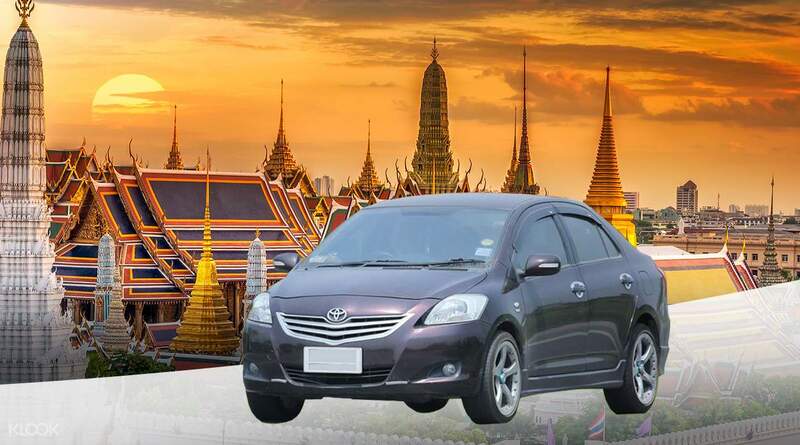 By Uber/Grab/Taxi: If coming from the Victory Monument Station to Dusit Palace (type Ananta Samakhom Throne Hall in Uber) fare is around TBH 95/PHP 145 (USD 3/EURO 2.41/SGD 4/MYR 12). By Bus: From Victory Monument, ride air-conditioned bus 12 or 515 to Dusit Palace at Ratchawithi Road. 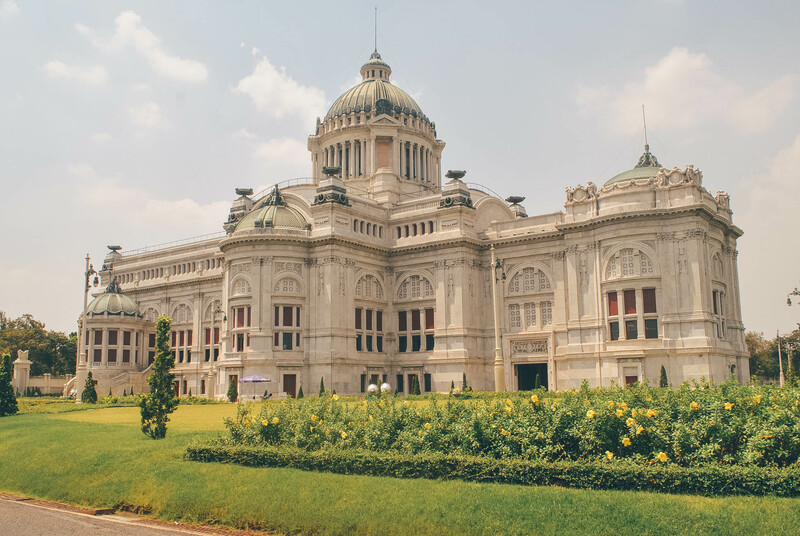 *Since the Dusit Palace (Ananta Samakhom Throne Hall) is close, you can replace this with a visit to Terminal 21 Shopping Mall. But if you still want to see the building, you can take a photo of it outside the gate and proceed to Marble Temple. Recommended: Option 2: ETD Terminal 21. Take the BTS Skytrain and alight at Asok. 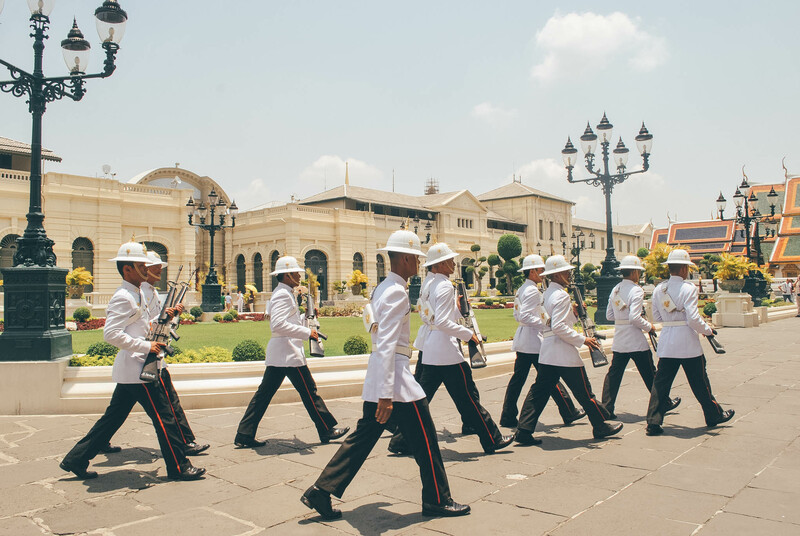 02:00 PM Option 1: ETA Dusit Palace (Ananta Samakhom Throne Hall). Just learned that this is closed already as of Oct 1, 2017. The magnificent Arts of Kingdom Exhibition has been moved to Ayutthaya. You can still take a photo of the building outside, but you can no longer enter. Recommended: Option 2: Explore, shop and eat at Terminal 21 until 3:45 PM. 02:30 PM Option 1: Walk to Marble Temple near Dusit Palace. It’s outside the Dusit Complex. Explore Marble Complex. Option 2: Continue exploring or shopping at Terminal 21. 03:45 PM Option 1: Uber/Grab/Taxi to Victory Monument Station. Fare is around TBH 95/PHP 145 (USD 3/EURO 2.41/SGD 4/MYR 12). Option 2: Walk back to BTS Skytrain from Terminal 21. 4:00 PM ETD Asiatique. The Riverfront. Ride BTS Skytrain to Saphan Taksin [S6]. From Saphan Taksin Station, take exit 2 to the pier, about 80 steps. 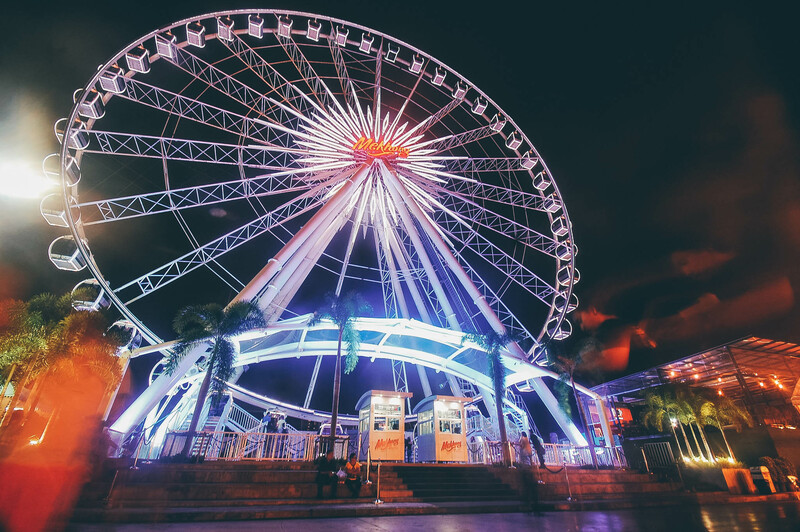 Take the ferry to Asiatique. Ferry runs from 4:00 PM to 11:00 PM. The FREE ferry runs until 8:00 PM only, so from 8:01 PM to 11:00 PM, you need to pay for the ferry. 07:30 PM Continue exploration or watch Muay Thai show. 10:00 PM Take ferry back to the port in Bangkok. 10:30 PM Take BTS Skytrain to Silom or Sukhumvit. If hotel is in Khao San Road. Alight at Silom at take Uber/Grab/Taxi to hotel. 11:00 PM Back at hotel. Shower. Sleep. 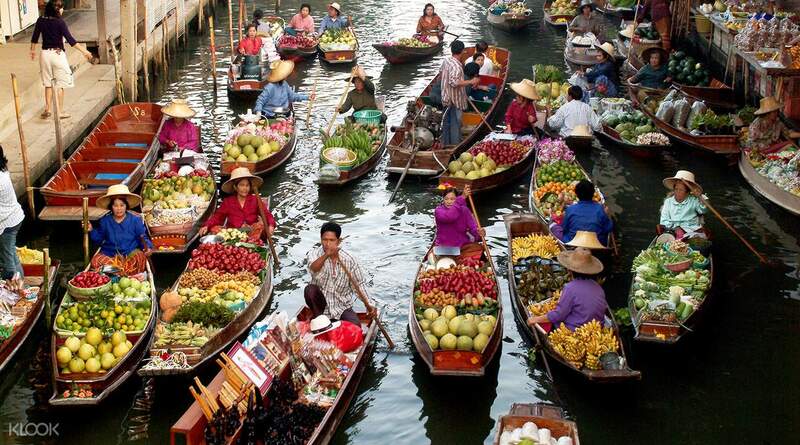 Here’s a sample 4 days 3 nights Bangkok itinerary with side trip to Pattaya. Feel free to tweak this depending on your budget and schedule. 10:00 AM Meet up at Century Mall, next to BTS Victory Station. Join Pattaya Tour. 11:00 AM ETD for Pattaya. Travel time is about 2 hours 40 minutes. 02:00 PM ETA Koh Larn Twaen Beach. 03:45 PM Meet the tour group. 04:00 PM Take speedboat back to Pattaya pier. 07:30 PM ETD for Bangkok. 09:30 PM ETA Bangkok – Century Mall near Victory Monument Station. 09:45 PM Take BTS Skytrain to Silom or Sukhumvit. 10:15 PM ETA Hotel. Shower. Sleep. DAY 4 ETD for Manila. Here’s a sample trip budget if you follow the Bangkok Itinerary 4 day 3 nights (Bangkok + Ayutthaya) above. TBH 107/PHP 163 (USD 3/EURO 3/SGD 4.36/MYR 14) Uber/Grab/Taxi to Khao San Road from Silom Station. If your hotel is in Silom Station or Sukhumvit Station, ignore this. 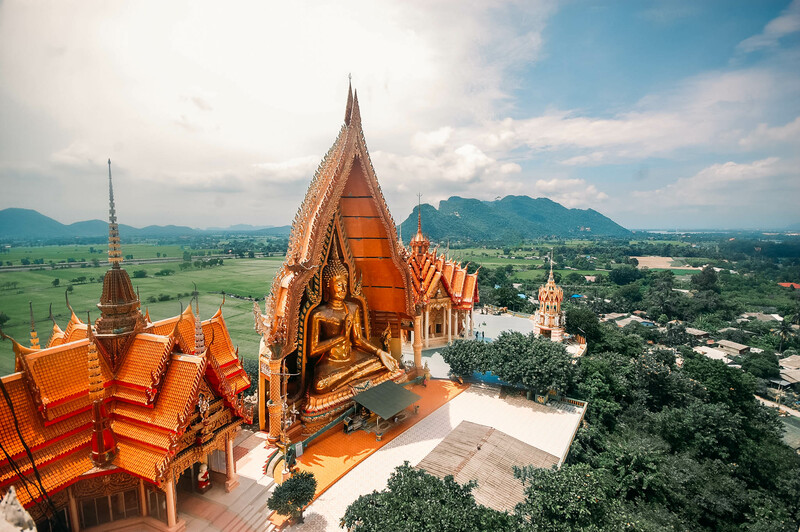 If you opt for Pattaya day trip instead of Ayutthaya day tour, you can replace the Ayutthaya budget with Pattaya City & Coral Island Day Tour from Bangkok with Klook for about THB/PHP 2,083 (USD 41/EURO 35/SGD 55/MYR 173). Total expenses for a 4 days 3 nights Bangkok trip if you follow the 2nd itinerary above is roughly TBH 6,026.03 / PHP 9,219/ USD 1180.26/EURO 153.46/SGD 246/MYR 764. If you plan to do a 5 Day 4 night Bangkok trip, then you can do both Pattaya and Ayutthaya as side trips. It is very important to abide by the Thailand laws listed below to avoid getting into serious trouble. Better be safe than sorry. Never disrespect Thailand’s King, Queen, Heir or Regent by insulting them or defacing images of the monarchy (such as stepping on a bank note). It’s a serious offense that can result in 3 to 15 years in prison. This offense is known as Lèse majesté in Thailand, based on Thai Criminal Code section 112. Never step on the bank note. It is a serious offense. Illegal drugs (using, carrying, transporting or producing) is punishable by death sentence. The drinking age in Thailand is 20. 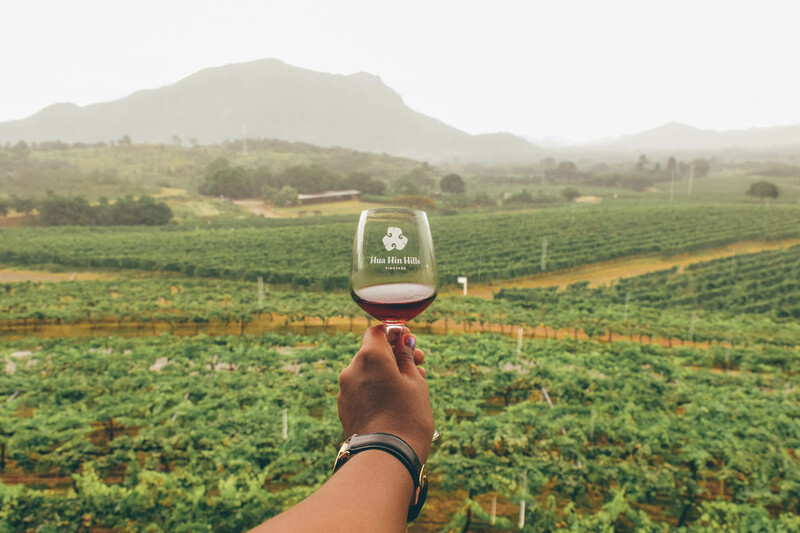 Drinking alcohol is illegal in the following locations in Thailand: temples or places of worship, public offices, public parks, pharmacies, petrol stations and education institutions. Do not throw chewing gum on the ground (be careful when you spit it, make sure it goes to the trash can!). If caught, there’s a hefty fine and you can be jailed. Do not litter in Thailand, you can be fined THB 2,000 if you’re caught. Take off your shoes when you enter a temple. Tuck your feet under you so that they are not pointing at anyone or anything when you are sitting on the floor. Never take photos of people while they are praying and do not have your picture taken with a Buddha image. Visitors are not allowed to enter a temple wearing revealing clothes like tank tops and shorts or skirts above the knees. Good thing, most temples will have sarong or pants for visitors to borrow. Female should never touch a monk or hand him anything directly. 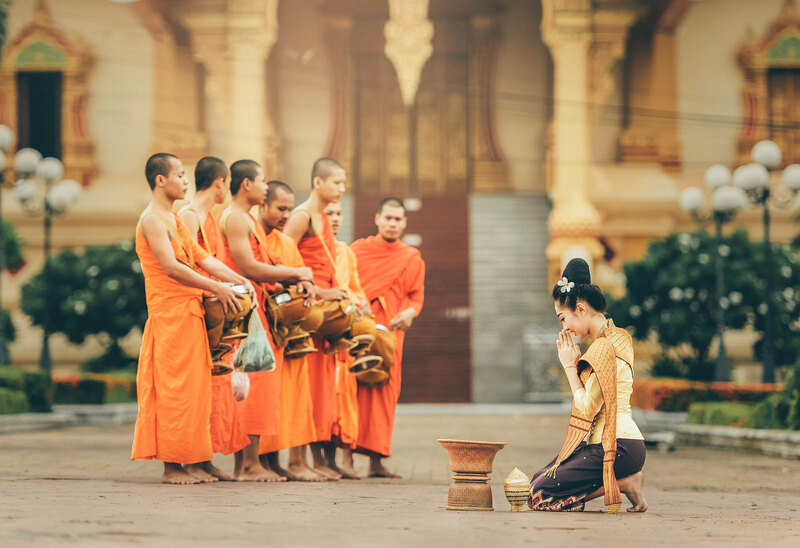 When offering alms, place it on a table for the monk to pick up. Also, do not sit next to a monk on a boat (or any public transportation) or stand in the same area of the boat. Do not touch them or their things. (CLOSED FOR TODAY/GEM SCAM): Don’t believe when a friendly local approaches you and introduces himself as a teacher and then will tell you that the Grand Palace or a certain temple or a certain attraction is closed for a Buddhist holiday or cleaning. He will then hail an accomplice tuktuk to tour you or take you to another temple or attraction. The driver will drive you around to gem stores or shops and get a commission for taking you there. I was told they usually get gas coupons. (TBH 10 or TBH 20 Tuktuk Ride): Don’t believe when a local approaches you and tells you that ferry is not frequent and will leave at certain times of the day only. He will then hail a tuktuk to take you around for about TBH 20/PHP 30 (USD 0.90/EURO 0.76/ SGD 1.22/MYR 4) but instead of taking you directly to your destination, the driver will take you to different travel agencies and shops. TBH 30 is a small amount but if you are pressed for time, this can ruin your itinerary. (FLAT FARE TAXI): When you ride a taxi and the driver refuses to turn on the meter saying it’s a flat fare taxi. The driver will most likely charge you about 3 times the usual meter rate. Get off and hail another cab. You are a blessing!! Thank you!! I’m about to go to Bangkok on the 2nd and my friend just frigging ditched me.. Thank you!!!! Hi! i just want to say thank you for posting this. It will make our trip so much easier and less hassle. Hi Gael, heaidng to Bangkok in two days from Canada. Last minute trip for 11 days. Very excited and I’m glad that I found your blog, some great ideas! Hi thanks for the Tip. Super great help. Can I ask a question. For any car or van hire in thailand in Klook, is it per vehicle or per person for the price? Just confused. Hello! may i ask if what is advisable? using a 4g sim or renting a pocket wifi? thanks. Wow! This is amazing! I’ll use this itinerary on my Bangkok trip. This is very helpful. Thank you for taking time to share your wonderful experience. More power! This would really help for our future thailand trip, but which most you suggest place to stay??? Near the victory mall and airport. Hi, Is there a “show money/proof of fund” at Thai Immigration? Thank you! Supposedly, but usually they ask those who’ve been crossing back and forth sa Thailand for visa run. Love how detailed this guide is. I actually send this to my mom since she’s going to BKK with her friends. She couldn’t thank me enough cause she’s able to fill up their itinerary. Bangkok is a great place to hangout. Really you have shared a great piece of information for Bangkok travelers. Your post is too long, but it is worth reading it. Good luck and keep writing! I went to Bangkok last year, but was only in for about a day and a half total as I was going south towards Chumphon. 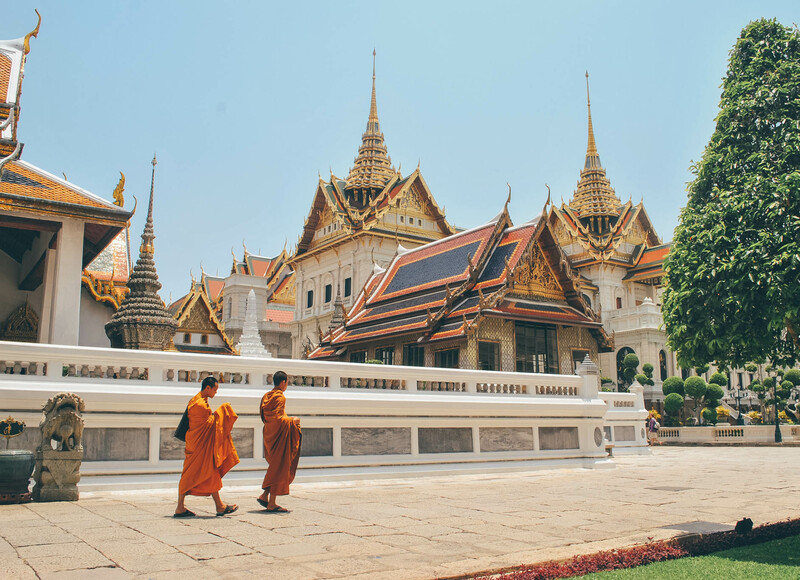 I love this guide and am looking forward to implementing it on my next trip in Bangkok! You sound very knowledgeable about the city and getting around. these kind of blog are so much informative and surely so much helpful for the bloggers that are really needed to be the at best part. This is really helpful.Thank you.